Hay fever symptoms can sometimes mimic cold symptoms, which unfortunately means that the discomfort is assumed to be 'just a cold,' and treatment gets delayed under the premise that the cold will soon pass. When symptoms repeatedly flare up, poor immunity might be blamed and again, a doctor's visit is postponed. The reality is that delayed treatment of hay fever can amplify symptoms and may lead to complications. It's important that you are able to differentiate between a cold and hay fever, so that you can quickly obtain treatment and relief. One of the common problems with confusion over hay fever and cold symptoms is that proper diagnosis and treatment are delayed because most people feel that a cold is too minor to warrant a doctor's visit. By learning which symptoms are likely to be hay fever ones, you can comfortably visit your doctor, who will thoroughly investigate the cause and determine if you do suffer from hay fever. One of the first indications that your symptoms may be due to hay fever rather than a cold relates to the duration of the symptoms. A cold virus typically doesn't last beyond a week to ten days whereas hay fever will usually continue to occur, and possibly get worse, over many months. If you are experiencing typical cold symptoms but it has been more than two weeks since their onset and in particular, if symptoms are worsening, it's wise to see your doctor. The uncomfortable itching that hay fevers can experience around their nose, throat and general facial area does not occur with a cold virus. Itching is a reaction that is common to many allergies - not just hay fever - but it is not characteristic of a cold. There are some key differences between the nasal congestion that you experience with a cold versus those you experience with hay fever. 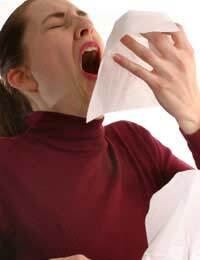 It's true that both a cold and hay fever can leave you feeling stuffed up and experiencing a runny nose and excessive sneezing. With hay fever, however, the nasal mucus tends to be watery and clear. Conversely, a viral infection will tend to produce thicker mucus that is yellow to green in colour. The name 'hay fever' is a confusing one and many people still associate the name with a fever. This, however, is far from the case. A fever is one of the defining features that can help you to pinpoint the cause of your symptoms, and result in you obtaining prompt treatment. While hay fever doesn't result in a fever, a viral infection can, so a fever won't normally indicate hay fever. Also, the aching and overall feeling of fatigue that often accompanies a viral infection isn't likely to occur with hay fever. Ultimately, your doctor will provide an accurate diagnosis for your symptoms. It is, however, helpful to be aware of the differences between cold and hay fever symptoms, so that you do initially seek treatment. Left untreated, you will continue to suffer and you also risk symptoms getting worse and leading to complications such as a secondary infection. If you have been suffering from the common symptoms of hay fever, make an appointment today to see your doctor for diagnosis and effective treatment. I don't agree that fatigue doesn't go along with hay fever. I am always fatigued when I have it. I have had this problem all my life. I think it depends on how severe the symptoms are. I also believe people would have far less problems if Prednisone was taken off the market. Steriods are not good for our bodies in any form.